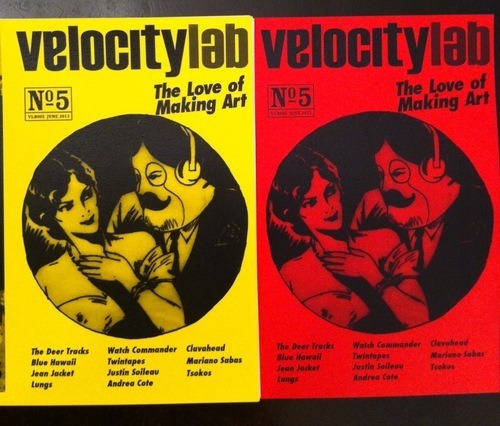 Announcing the latest issue of VELOCITYLAB! It’s been a while since my last post here, I know. Well, at least it feels like it has been. In the meantime, I have been busy at work on the latest issue of my zine, Velocitylab. I’m already up to No5 and it seems it’s only getting better each time. With this issue, I’ve interviewed some incredible bands (The Deer Tracks, Watch Commander, Jean Jacket, Blue Hawaii, Twintapes, Lungs and Justin Soileau,) and have collaborated with artists, while other artists contributed their own original pieces. I’ll try to update you all as much as possible. Hope you enjoy… and head on over to Velocitylab now for your very own limited edition copy. Do it now! Limited edition copies await! Choose red or yellow.. reminiscent of the old Art of Kissing and How to Make Love books of the 1930’s. Enjoy! I liked him already; respected his dedication to his craft; I can say that I even loved the things he did. But when I read this, I started to feel what Jack White is all about quite a bit more. He was named Record Store Day 2013 Ambassador and has released a statement/quote on the RSD site. Check it out here. Whether you believe in all of it; agree or not; ambivalent or (gasp) unmoved… It’s worth the time to read. And furthermore, worth the effort of thinking about it a little more. Remember, he’s not talking about things on their face value; not the record store -vs- video game. Not at all. Those are representations of something deeper. More meaningful. For The Love Of Vinyl. It was the feeling of having a stack of old records in my hand—the 12″ LPs in this particular case—that brought me back to a time when I actually felt I was a part of that musician’s (or band’s) history in the making; piles of records (and stacks upon stacks of tapes,) intensified the fan that I was. Now you would not be surprised when I tell you that I am someone who actually picks up a book and breathes in the air between its pages, so it should be natural for you to hear how I brought my nose to the record sleeves so I may take it all in. Being that my sense of smell instantly activates my memory, I was almost literally physically transported back to that time in the past. This happened a couple of years ago while visiting Toronto, digging through crates one winter morning, just inside the rusty swinging door of a used-everything shop. It was there that I excitedly came across a few records I wanted to add to my collection—a small collection that had long since taken a back seat in my life. My love—I almost said need—for vinyl never went away, but much like vinyl itself, it waned a bit as it tried to find its proper place in the world. I was quite fortunate that I still owned my record player and to go along with it, had that collection of records back home that—until that point—consisted mostly of indie, emo and punk rock from the 80’s and 90’s. I have since expanded on my musical tastes, as well as the record collection I call my own. Walking away from that store with more than a few records tucked under my arm with a frozen grin on my face, trudging through the cold and small mountains of snow in my path, knowing that those records will not go by the wayside only made my finds that much more gratifying. Looking at part of my record collection lining the upright shelf now—counting the likes of Fever Ray, Sammy Davis Jr., Lykke Li, Marianne Faithfull, Surfer Blood and The Black Keys—I have this swelling sense of accomplishment and a small bit of selfish pride knowing that as vinyl enjoys its time in the sun, I am happily finding myself somewhat glowing at its side. 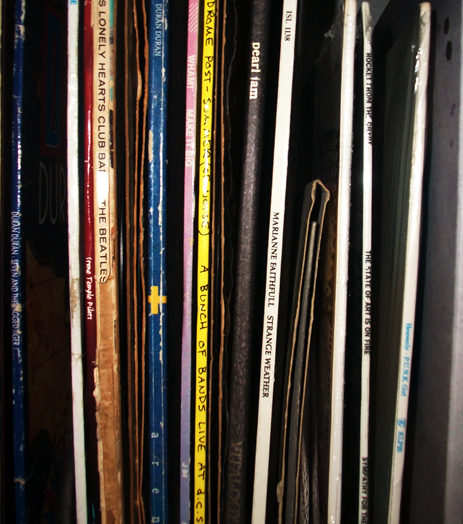 You know this might be the first piece I’ve written on the love of vinyl, but it will most definitely not be the last. PS — This past Black Friday, I was among many others who made their way to independently-owned record stores for limited release pieces on Record Store Day. And to illustrate one great reason to experience that sense of pride: watch here as The Black Keys show us how their reverse groove vinyl was pressed.